Base your pizza toppings off existing dishes when trying to get weird. While a sauce of reduced Red Bull topped with nacho cheese and crushed up Doritos sounds hilarious, chances are it won’t be that good. Trust me, this is coming from a person who once topped a pizza entirely with baby food, and guess what? It was total garbage. Turns out babies have horrible taste in food. But don’t let them discourage you. One of the best things about pizza is how forgiving it is as a medium. Another good rule to keep in mind is to not overtop your pizza. I’ve noticed that people tend to add too many ingredients, which makes it hard to focus on the whole pie as a unified flavor experience. Come up with a recipe, and see what ingredients you can remove while still staying true to your goal. This way the rest of your toppings will shine. 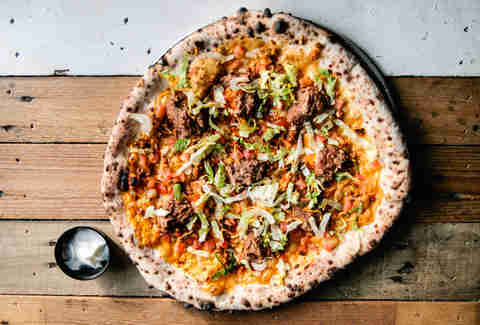 So I put these rules to the test with one of my fellow pizza makers in crime, Danny, and we came up with five surprising pizza topping combinations that sound ridiculous but are actually incredible. If you’re into Alfredo sauce pizzas, this one's for you. White gravy is based mainly off of milk; if you add crumbled breakfast sausage, it’s almost a full pizza by itself. Add a sprinkling of Cheddar, crumble up some already-baked biscuits (leftover, fancy, pre-packaged, any will work just fine), and throw some scrambled eggs or a runny fried egg on the pie after it comes out of the oven. 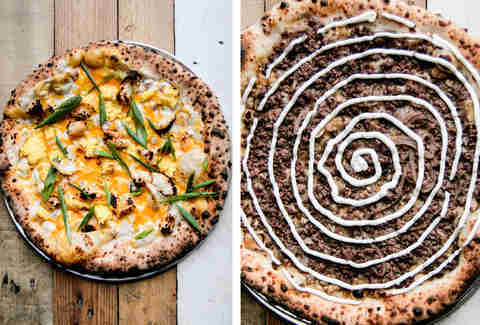 Purists may scoff at a breakfast pizza, but that is 1,000% their loss. After threatening for months to make a Tuna Helper pizza (I have my limits), Danny and I finally compromised on Hamburger Helper instead. He sautéed onions and mushrooms with the beef stroganoff seasoning packet and added a hefty swirl of sour cream post-bake. The result is hilarious and a little shameful, but it’s oddly addictive. We also tried a cheeseburger variation with great success. I used to eat the microwaveable chicken cordon bleus in college since they were a welcome departure from Hot Pockets and instant ramen. Breaded chicken, ham, cheese, what’s not to love? While Swiss cheese tends to be the cheese of choice in most recipes, I prefer Gouda, which is gentler and creamier. One of the best things about this topping combination is that you can make it fancy with nicer cheeses, variations on breaded or fried chicken (chicken tenders work well, surprisingly), and you can substitute the ham with cured pork like prosciutto. I try to add a pop of color, so a sprinkling of fresh parsley makes it look pretty. 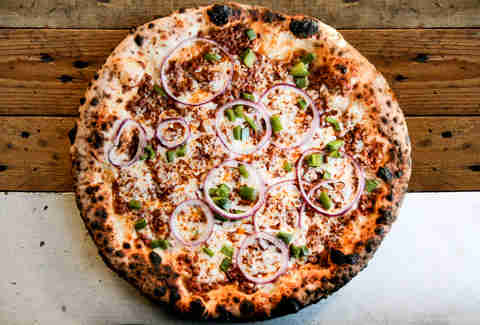 Sloppy Joe pizzas are also fantastic. When you think about it, sloppy Joe meat has a red sauce built right in. And since sloppy Joes are served with an excess of meat, don't be afraid to layer it on thick. I recommend topping it with low-moisture mozzarella (the fresh stuff will end up being too soggy), and a few minor garnishes like green bell pepper and red onion. That way, you know, it feels like you actually put some thought into it. Yes, using fast food as pizza toppings is stupid. But it’s definitely funny, and I’ve had wild success with Arby’s and McDonald’s pizzas. This homage to Taco Bell, the greatest fast-food restaurant on the planet, was cobbled together by Danny. He mixed nacho cheese sauce with a few packets of Fire sauce, topped it with their gourmet paste-like taco meat, refried beans, and tomatoes. Post-bake, he added the lettuce, Cheddar, crumbled Nacho Cheese Doritos Locos Tacos shell, and crumbled up tortilla chips. While this one breaks my less-is-more topping suggestion, I mean, come on, it’s fast food. Also, if you ask nicely, Taco Bell employees will happily pack up the ingredients into separate packages for you. Now that I’ve armed you with some ideas, go, my children. Unleash your genius upon the pizza world. You have my blessing. 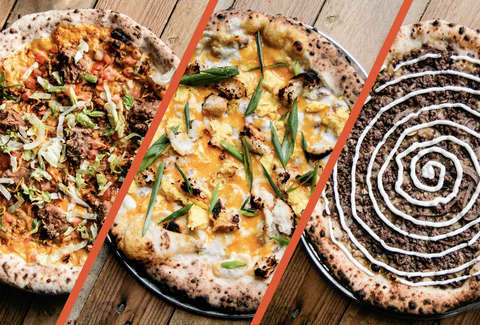 When Dennis isn’t busy being the greatest food writer in all of history, you can usually find him accidentally dropping pizza on the floor at Paulie Gee’s Logan Square.